Stock photo of Leonardikirche, the beautiful and also the oldest church in downtown Frankfurt surrounded by modern buildings, Frankfurt, Hessen, Germany, Europe. Leonardikirche, the oldest church intermingles with modern buildings in Frankfurt, Hessen, Germany. 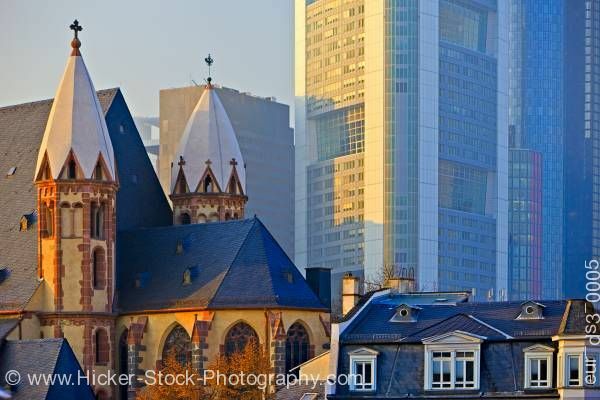 This stock photo shows Leonardikirche, the oldest church in downtown Frankfurt surrounded by modern buildings, Frankfurt, Hessen, Germany, Europe. The ornate church dominates the scenery with the two stone four story towers on each side. Each tower has a white dome and a cross finial on top. The middle section of the church has a pitched black roof. The end part of the roof is partially domed shaped with three sides. Stained glass windows are between the flying buttresses. The roof of a building is in the foreground to the right of the church. The white grid windows are a contrast to its black roof. The background shows a modern town with its tall modern skyscrapers. Leonardikirche, the oldest church in downtown Frankfurt surrounded by modern buildings, Frankfurt, Hessen, Germany, Europe.